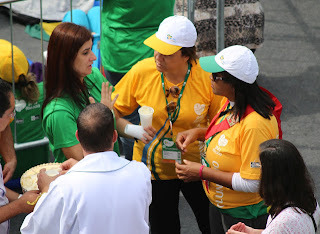 The World Youth Day has been a great success since its beginning in the 1980's. Blessed John Paul II started the event and it has continued undisturbed, drawing millions of young people. However, the Liturgy in these events are sometimes presented in an irreverent manner. This will bring about anger, especially among those who call themselves "Traditionalists" or "conservative." I was made aware of some things that occurred at liturgies during the World Youth day in Brazil that turned my stomach. In a Mass at the Shrine of Our Lady of Aparecida, the Gospel procession was carried out with some woman on a float type thing turning around while smiling. I really don't understand what was the point of this or if this is some cultural aspect of the Brazilian people. However, I found it to be out of place and irreverent. A deacon or priest should be the only one carrying the Book of Gospels. Having a lady on a float spinning around really does not bring my mind to God, but makes the words 'what the..' come to mind. Moreover, at another Mass; Holy Communion was distributed with plastic cups! Yes, those cups we use at picnics and parties! This is just unacceptable. The Blessed Sacrament must be treated with the utmost respect. Whoever presented this idea was either affected by the sun's heat or was just plain stupid and not thinking. where it was dirty and foul with the odor of animals. Christ took the form of sin. (2 Corinthians 5:21) In other words, He became one of us in our lowly state but without sinning. Would Jesus care if He was in a golden ciborium with diamonds or a plastic cup? I honestly don't think He would. However, this does not mean we can just place the Blessed Sacrament anywhere we want. We are sensual creatures who rely on our senses to learn. Using nice vessels for Mass serves this purpose. It calls our attention to the mysteries and importance that these vessels will be used for. God has no need for them of course, we do because we need things that are visual and bring our minds to focus. 327. Among the requisites for the celebration of Mass, the sacred vessels are held in special honor, and among these especially the chalice and paten, in which the bread and wine are offered and consecrated and from which they are consumed. 328. Sacred vessels should be made from precious metal. If they are made from metal that rusts or from a metal less precious than gold, they should generally be gilded on the inside. 329. In the Dioceses of the United States of America, sacred vessels may also be made from other solid materials which in the common estimation in each region are considered precious or noble, for example, ebony or other harder woods, provided that such materials are suitable for sacred use. In this case, preference is always to be given to materials that do not easily break or deteriorate. This applies to all vessels that are intended to hold the hosts, such as the paten, the ciborium, the pyx, the monstrance, and others of this kind. 330. As regards chalices and other vessels that are intended to serve as receptacles for the Blood of the Lord, they are to have a bowl of material that does not absorb liquids. The base, on the other hand, may be made of other solid and worthy materials. 331. For the Consecration of hosts, a large paten may fittingly be used, on which is placed the bread both for the Priest and the Deacon and also for the other ministers and for the faithful. 332. As regards the form of the sacred vessels, it is for the artist to fashion them in a manner that is more particularly in keeping with the customs of each region, provided the individual vessels are suitable for their intended liturgical use and are clearly distinguishable from vessels intended for everyday use. 333. As for the blessing of sacred vessels, the rites prescribed in the liturgical books should be followed. No thought was given to the lack of reverence in having the Blessed Sacrament in plastic cups. Moreover, no thought was given to the particles that may have been left over in these cups. In light of this, I understand the anger of traditionalists. I too share in the disgust and anger; however, I also respect the authority of the Church to adapt liturgy to the times and circumstances. The Catholic Church allows for inculturation and adaptations to be done to the Roman Rite in order for it to speak more to people of different cultures. The Catholic Faith must be able to speak the language of the people receiving it, so to speak. Since its infancy, the Catholic Church has inculturated elements from different cultures. Similarly, Judaism has inculturated even Pagan rites to its own rites in order to help the Hebrews understand the Jewish faith after being under Pagan influence for decades. The use of Church buildings and altars are things that we inherited from the Jews who inherited them from Pagans. (Fourth Instruction on the orderly carrying out of the Constitution on the Liturgy) The Catholic Church had no temples until Constantine handed them over to the Church and we Christianized them. The Church has incorporated cultures and perfected their rituals in Christ since the beginning. So here, the Church is clear that we cannot become rigid in the liturgy and faith. We must 'respect and foster the genius and talents of the various races and people' in order to present the Gospel in a manner that speaks to all. We cannot get caught up as to whether the Mass should be in Latin, whether the priest should face the people or not, or whether a guitar or organ is used. Granted, bishops and priests need to be more prudent when planning Liturgies so that this respect of the talents of other races and cultures does not turn the Liturgy into a circus. In light of this, whoever planned the Liturgies of World Youth day in Brazil did not do their homework. Perhaps things were rushed and they tried their best to make it work. The security mishap where Pope Francis' motorcade took a wrong turn might be an indication that the planners did not anticipate many things. Nevertheless, I don't think these Liturgies were planned in order to cause scandal or abuse. I think they were planned with good intention but without prudence. The Church allows for adaptations to be done in order to better present the Gospel, but those adaptations have limits. As stated above, changes to the Liturgy must enhance the presentation of Christianity to the people, not water it down or make it pleasing as if the Liturgy is some show where we have to keep the people interested. The main goal is to evangelize the people; to preach the Gospel by using their own culture and music to bring it alive to them, not alter it to become a concert or a smokes and mirrors event. In closing, I feel the Vatican needs to have better control over Liturgies at World Youth day and any Papal liturgy in general. How Holy Communion will be distributed must be planned to the letter especially since these events bring millions of participants. It pains me to see these photos of the Blessed Sacrament being distributed in plastic cups that are often used to serve kool aid, soda, and even liquor. As for the lady on the float during the Gospel procession; well, I'm not sure the cultural significance behind this so I will just say I find it odd and personally would not permit it in my parish or diocese if I become a bishop. 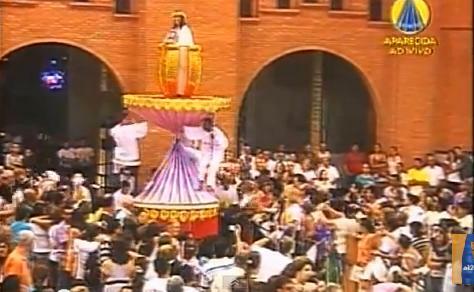 Perhaps a Brazilian can message me and tell me if this procession had some cultural element recognizable to the Brazilian people. Let us not become discouraged when we see these things. Again, I don't think they were done with the intention to be irreverent. I believe these are a case of poor planning. Let us respect the Church's laws and our leaders and avoid becoming like the Pharisees pointing out faults in the way others carry out rituals. Liturgists must be prudent and organize Liturgies that reflect the Roman rite in a reverent manner and also speak to peoples of every race, gender and culture. "Lex orandi Lex Credenti" or the 'law of how we pray is the law of how we believe.' Let us pray how we believe. We believe in the one and only great God who must be respected; so let us pray with respect.